Our Edmonton EverLine location provides professional, high quality road marking services to all of Edmonton and the surrounding communities. We use premium materials, equipment and highly trained crews. We can work within your business’s budget. 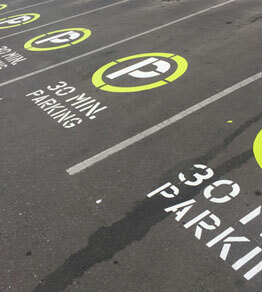 Everline Coatings and Services is the premier supplier of outdoor road marking services for parking lots and roads in Edmonton and the surrounding areas. We started EverLine Coatings and services to become the leading line painting company in Alberta and we’ve gained the needed experience and equipment to take on any line painting job that needs to be done. Our Edmonton location has multiple experienced road marking crews enabling us to paint 3 to 4 locations depending on the size of the surface at the same time and get the job completed in a timely manner. Our large and experienced crews are able to get any line painting job your property needs completed on a short notice. If you need a professional line painting job done immediately, we’ve got you covered. We are also proud to offer our high quality services at competitive prices as we are one of the largest paint and supply purchasers in Alberta. Please contact our Edmonton office today for more information or to inquire about our road marking services. At EverLine Coatings and Services, we strive to offer you the best quality we can and we are constantly innovating the way we deliver our services to serve you better. We’ll always answer the call when you need our services. We always train our crews to the highest standards to ensure good quality workmanship, use the best paint and supplies on the market to ensure a long product life, and use the best equipment available to ensure quality and efficiency. At EverLine Coatings and Services, we are a well equipped and well staffed painting and services company with a small business approach and mentality behind our services. Our multi-crew approach gives us the ability to paint multiple locations at once or provide you with immediate service if the situation arises. We will work with you to ensure that your needs are met in the best way we can possibly serve you and create a line painting solution for your property. Regardless of how big or how urgent the job is, we can handle it. When you use EverLine Coatings and Services you get the EverLine advantage. We are one of the biggest purchasers of paint and coatings in Canada. This means we can purchase our supplies in bulk at a discounted rate which enables us to extend our savings to our customers. We have experience working within various different budgets and project sizes and can work with you to provide services that work within your unique budget. At EverLine Coatings and Services, we have many years of experience in the parking lot painting service industry. Seeing as we’re some of the most experienced in our industry, there’s not job to big or too small for us to complete. We’ve worked on a large variety of road marking projects and we are ready with the needed experience to get the job done. Need something repainted? We can help! We are able to repaint existing parking lot lines, curbs, stencils (all types, shapes, sizes, and colours), crosswalks, stop bars, arrows, handicap spots, and the like. You name it, we can repaint it. Need a new parking lot layout completed and painted? These are our specialty. Seeing as we have decades of experience, we can use our expertise to help you plan out a new parking lot layout and execute the project with the quality and professionalism your property deserves. Our new parking lot layout projects always look great and exceed our customers expectations. What about roads and streets? At EverLine Coatings and Services, we have decades of experience painting municipal roads and streets. We know how to paint a road effectively in Alberta to stand up to the elements. Street markings, crosswalks, stop bars, arrows in intersections, customized stenciling and signs, you name it, we do it all. If you will be using EverLine’s line painting services in the near future there are a few things we ask you to do in preparation to ensure we can complete the job in a safe and timely manner and ensure a quality line painting job. Ensuring that the Parking lot has been swept clean is very important. Any gravel or debris in the parking lot could impede the quality of the work. If you need your lot swept, please enquire about our parking lot sweeping services. Please ensure the lot has been cleared of as many vehicles as possible. Finally, please notify the regular users of your lot that we will be painting in the lot. This will ensure that there are no unnecessary stoppages or distractions.